The little country of Guatemala is spotted with numerous volcanos strewn about in many of its regions – both dormant and active volcanos. The southern part of the country is very mountainous and has about thirty in all. It was on one New Year’s Day when we were living there, that my son Levi and I thought that a nice way to begin the New Year would be to hike up volcano that we had not yet climbed. We had trekked various other ones before that time, but this one, we had not. It was the volcano named Santa Maria, located in the western part of the country. Actually, it was on the previous Thanksgiving Day when we had decided to do this. Since we had no turkey on that day, instead of eating a banquet, we decided to climb a different volcano that was closer to our home. That particular day turned out to be such a crystal clear and wonderful day, that from the top of the peak, we could look down much of the line of volcanoes that runs along this southern mountain range of Guatemala. The range is called the Sierra Madre de Chiapas. On that day, we could count what we thought were at least eight of these volcanos. One of the further ones that we could see was the dormant volcano, Santa Maria. This volcano, despite being one of the furthest ones that we could see, was only about a half a day drive from our house. We decided right then, on the top of that Thanksgiving mountain, that on some clear day in the near future, we would go a nearby town, get a hotel, and climb it on the following day. 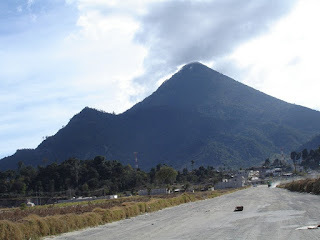 The town near the volcano is called Quetzaltenango, but the original Mayan name for the town is Xelajú. The Mayan name means “Under the ten peaks.” This is because the town sits in a valley surrounded by ten mountains. The volcano Santa Maria is one of these mountains. The writer of the book of Hebrews, in speaking of being disciplined by God, says this: “It is for discipline that you endure” (Hebrews 12:7 NAS). The phrase struck me as a little peculiar, since it seemed to be saying that the purpose of enduring was only so that we could be disciplined. It sounded as if our goal or our objective should be that we be reprimanded. In other words, it seemed to be saying that we should bear up under our suffering so that we can be disciplined again. Surely not very many of us would put it in this way or think of it like that. We are certainly not seeking to be disciplined. We would probably like to change the preposition to say something in the order of “it is through discipline that you endure,” rather than "it is for discipline." That seems much more satisfying. By using the word through in this sentence, the act of being disciplined is made not to be the goal. Instead, our goal or our objective would instead be the endurance, much like an athlete in training who learns to discipline himself in order to build up his stamina. This is self-discipline (which we all respect) instead of a type of discipline set upon us as a punishment. Discipline as a punishment is less satisfying to us, since it shows that we have a weakness or a flaw in our character that needs to be dealt with. The building of self-discipline actually is the spin that the New International Version puts on the phrase. This translation takes out the preposition altogether. In addition; it makes the phrase sound more like a commandment: “Endure hardship as discipline.” To me, this sounds like when we endure hardships, it will build in us self-discipline. I agree that this is true, but I am not certain that this is the sense of the verse. I have fought the good fight, I have finished the course, I have kept the faith; in the future there is laid up for me the crown of righteousness, which the Lord, the righteous Judge, will award to me on that day; and not only to me, but also to all who have loved His appearing (2 Timothy 4:7-8 NAS). In the woods in back of the farm where I was raised are the ruins of an old farming homestead. The house and small barn of the old place have now long since collapsed, leaving nothing but the rotting logs of the buildings. When I was a boy however, the shell of the old log house was still standing, shaded by tall hemlock trees by its side. The roof of the house had mostly fallen in, and the floor had been torn up by some kids who had heard the boyhood tale that the family that once lived there had buried some treasure under the floor boards. There was no glass in the window sashes of course. I am sure they were the first things to be broken. The fields around the house were grown up in poplars and alders. The fence rows of stone that once had surrounded the fields had also long ago toppled, and trees grew through the stones. The farmstead had a look of total abandonment. As a young lad, I would often meander around this old site and wonder about this family who lived there before I was born. Did they have boys like me who liked to explore the woods and walk along the creeks? Did the small children run out to the field at noon to tell their Dad that it was time to come in for dinner? The truth actually was that the family did not live there very long. They made a beginning, but after only several years at the farm, they moved on to a different life. I am sure that this move from their farm was not their plan from the beginning. They certainly would not have put so much effort into building a house and barn, clearing the land and digging a well, if they had not planned on staying long. The beginning that they made was one of permanency. I do not know the particulars of what happened to this family or what circumstances occasioned their departure. Perhaps they had to endure death or some other tragedy that had caused their plans to change. I mean no criticism of the abandonment of their plans, but it has taught me a lesson of permanency. The meaning or the significance of a title can change over the years. For instance, during the Revolutionary War, to be an “American” was synonymous with one who held strongly unto the values of our emerging nation. Today, the term American does not necessarily carry this same inherent meaning. Many who are called American in these days do not believe in the form of government that was initially drafted in the founders of our country. Today, to be an American means nothing more than someone who is from America, regardless of their beliefs concerning the system of government and the guiding values of the country. It is much the same for the term Christian. To be called a Christian today does not nearly have the meaning that it did originally. Much as the term American has ceased to be synonymous with the principles of the founders, to be called a Christian today also does not necessarily mean that one agrees with what Christ and the early apostles taught. It is in fact, even more difficult to give a realistic contemporary definition to the term Christian than it does to the term American. However, at its core and true to its origins, what it means to be a Christian must be one who follows Christ. This in fact, is exactly the sentiment of the first Christians. They actually did not even at first call themselves Christians, but instead described themselves as followers of “the Way,” probably having some reference to the words of Jesus when he said “I am the way, the truth and the life, no one comes to the Father but through me” (John 14:6). The Way was actually quite a descriptive term for them, since the teaching of the early church centered on the way of God (Acts 18:26). When the term Christian began to be used, it seems not to be one that the early believers chose for themselves. It was one that apparently was given to them by the people in the city of Antioch (Acts 11:26). I read in a couple of different sources that the people of Antioch were especially fond of giving nicknames to people. They gave nicknames to their kings. The term Christian may have at first even had somewhat of a derogatory connotation, but the early Christians of that day instead took it for themselves and even took pride in it.